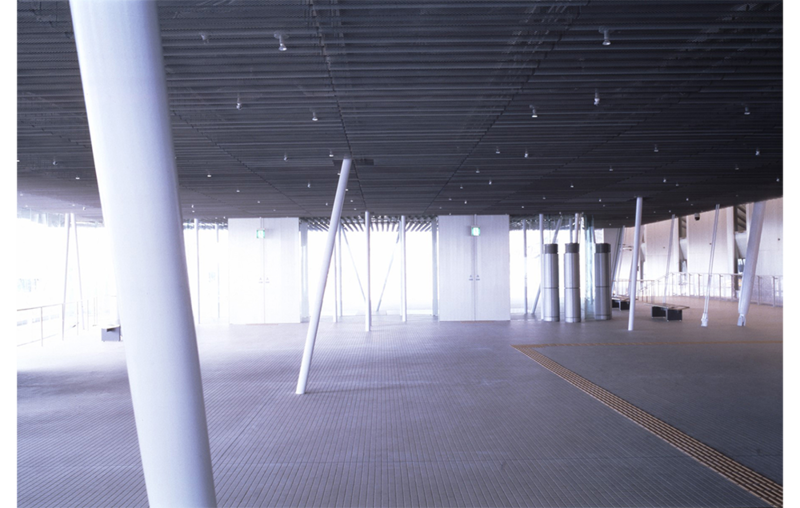 ビッグパレットふくしま / Big Palette Fukushima | 北川原温建築都市研究所 | Atsushi Kitagawara Architects Inc. 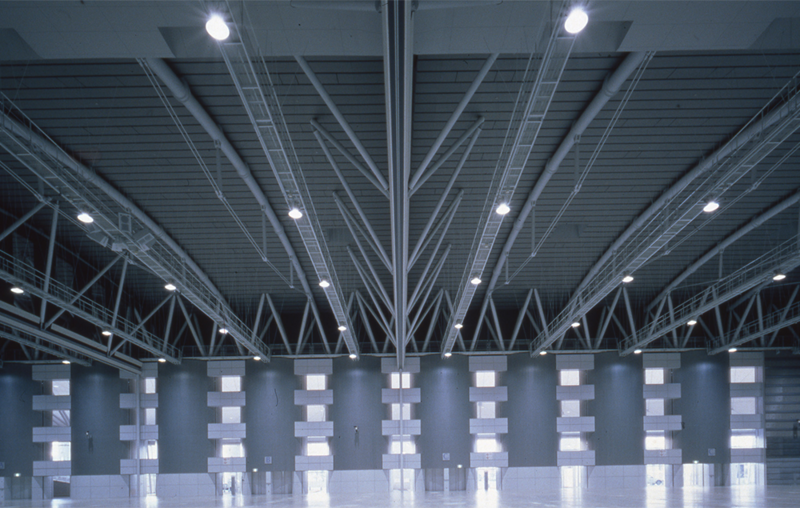 Built in Koriyama-city, Fukushima Prefecture, this facility complex consists of a 5,500m2 multi-purpose exhibition hall, a 1000m² international conference hall, conference rooms and service facilities (total floor area : 23,000m²). 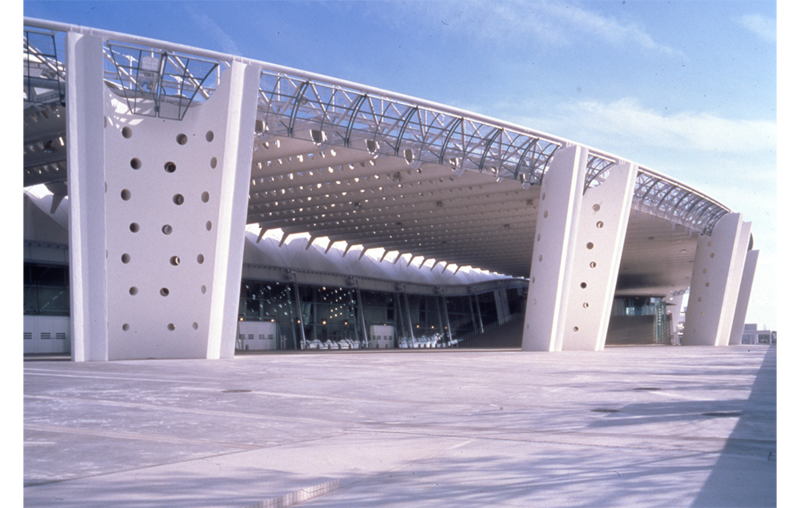 The complex can be adapted for industrial exhibitions, regional festivals, international conferences, concerts, sports events, et al. 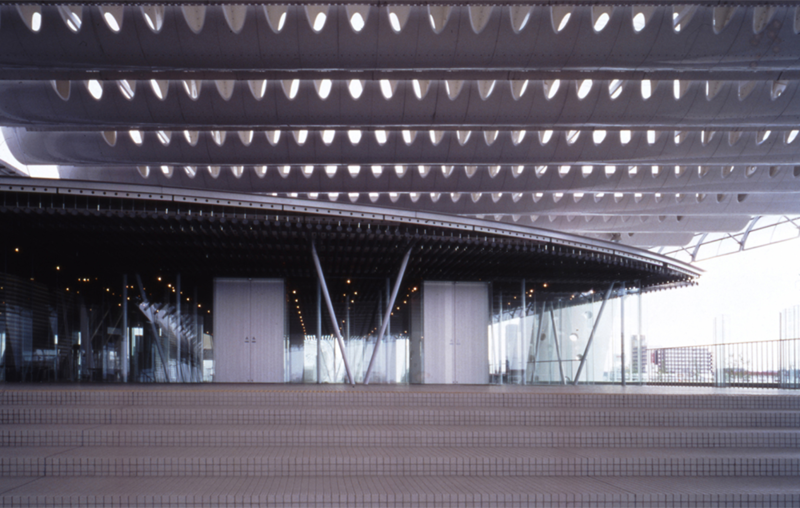 The name of the building, “Big Palette” derives from the large elliptical roof, which provides its external character. In the case of the “Big Palette”, the basic image of the architecture was a metaphorical one; “water”, the “incubator” of all life. 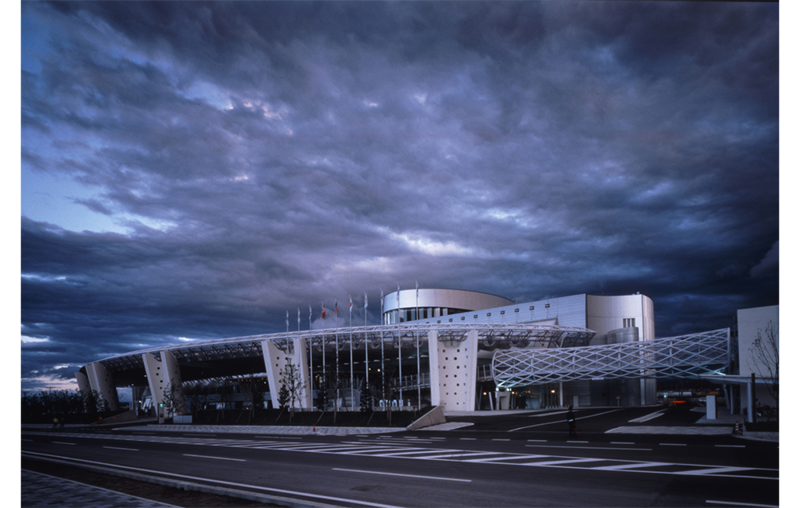 This metaphorical and poetic concept came from the history of this region. 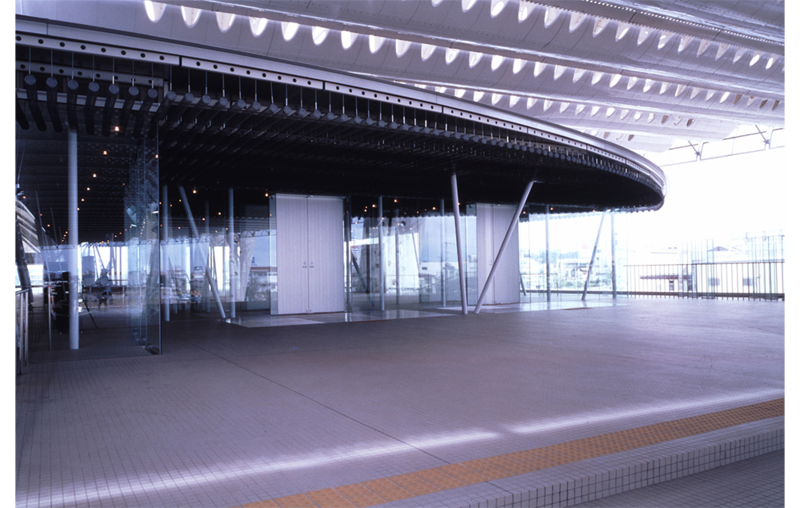 The eaves overhanging over the External Exhibition Space are composed of tubular louvers of Carbon Fiber Reinforced Plastic (CFRP). 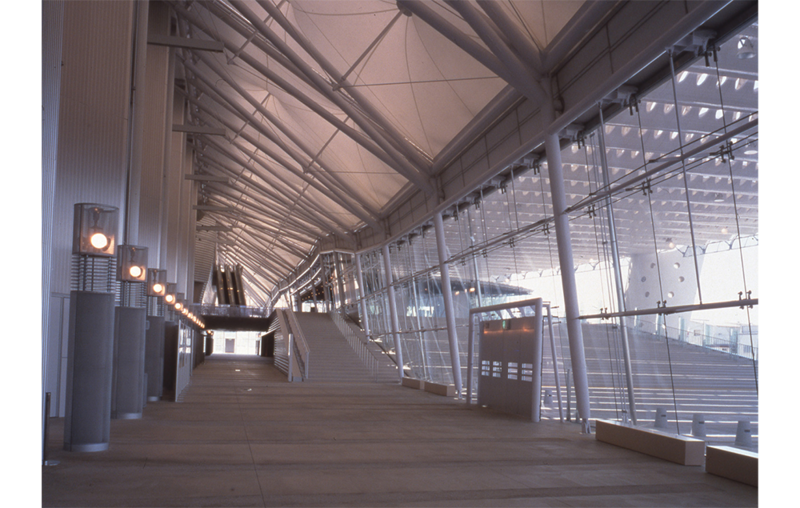 The lattice structured Pedestrian Deck stretches from the parking lot for 220m in length joins an entrance lobby on the second floor and lead to the “Atrium Lobby” enclosed by the multi-purpose exhibition hall and the convention hall / conference room block. 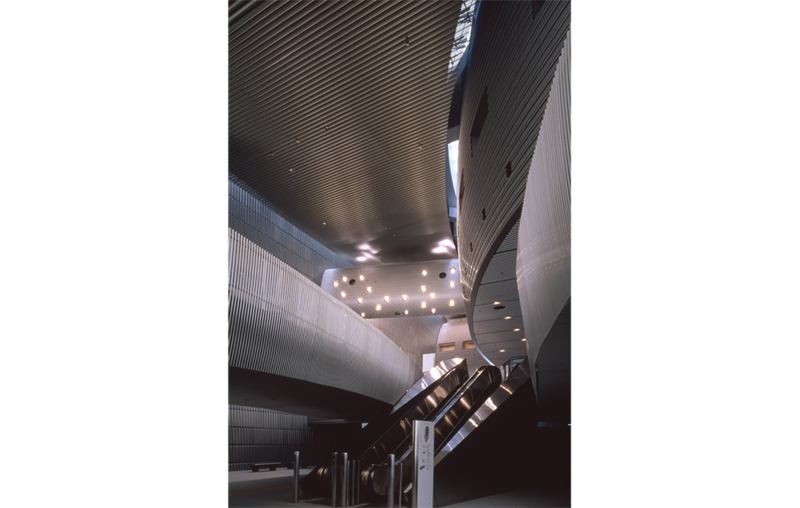 The application of ready-made and custom-made metal and patterned panels according to circumstances is used to provide visual expression both internally and externally. 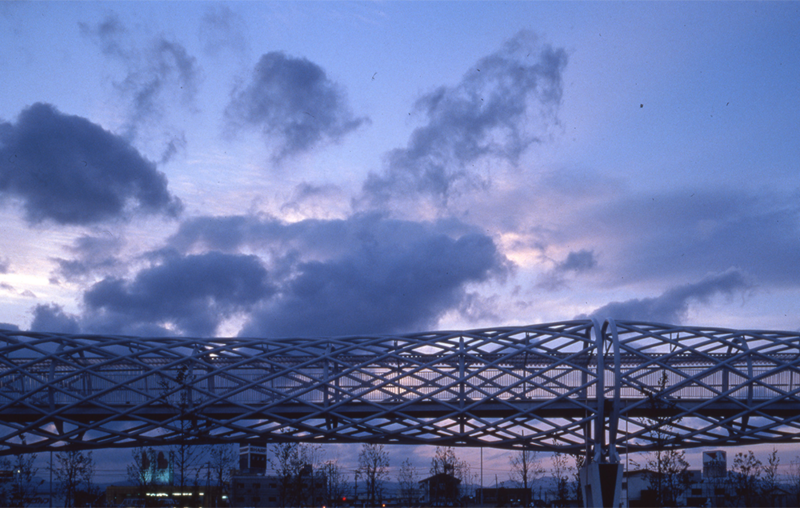 The dynamic advanced design such as catenary curve roof structure, reverse conical fan column connecting keel truss, pedestrian deck linked laterally to HP shell, carbon fiber attracts its users and people who visit there. The concept is based on a drop of water. The city of Koriyama has developed by Azumi Sosui and its water originally led from Lake Inawashiro, planed by a Dutch civil engineer Cornelis Johannes Van Doorn. A drop of water as a source of life forms an oval incubator, which develops each of organs in accordance with the program. This process does not represent, though, analogy of the organic structure, but the spatial machine operated by cool mechanism. 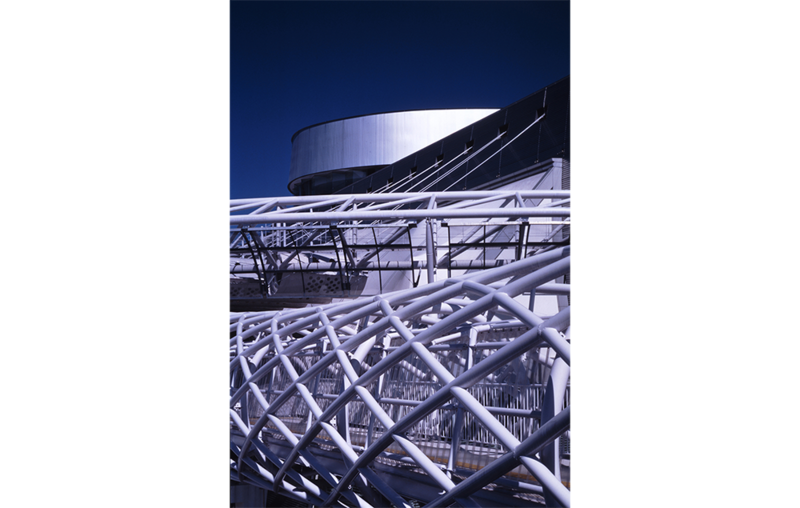 Accordingly, we installed a big roof called Mother Roof as basis of organs, Hyper Lane as symbol of a flow from the south to the north and Miharashi-no-oka as observatory hill. Once the project set out, we started with articulating the image of architecture into tiny parts. The parts were separated according to their functions and characteristics, then classified and arranged to reconstruct the whole image while designing new parts at the same time. In due course, some byproducts were brought in as interfaces between the parts. 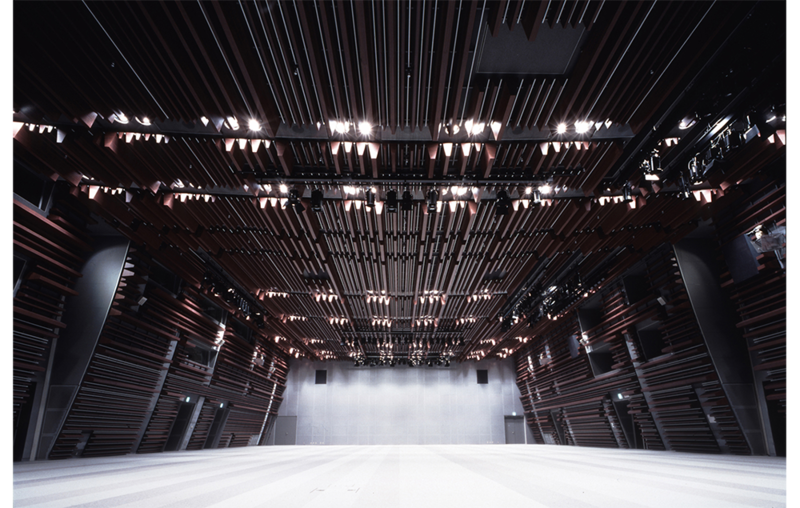 We referred to the scores of Bach and Bartok in terms of combinations of parts, arrangements of joints and repeating patterns.We were intended to superimpose a reticent appearance of architecture on the site. It is such as a glider which rides winds and flies gently with lifting power, while a jet airliner consumes artificial energy and cuts through the air. In other words, the counter shading, a camouflaging method of plant and small animal, seems to be effective. 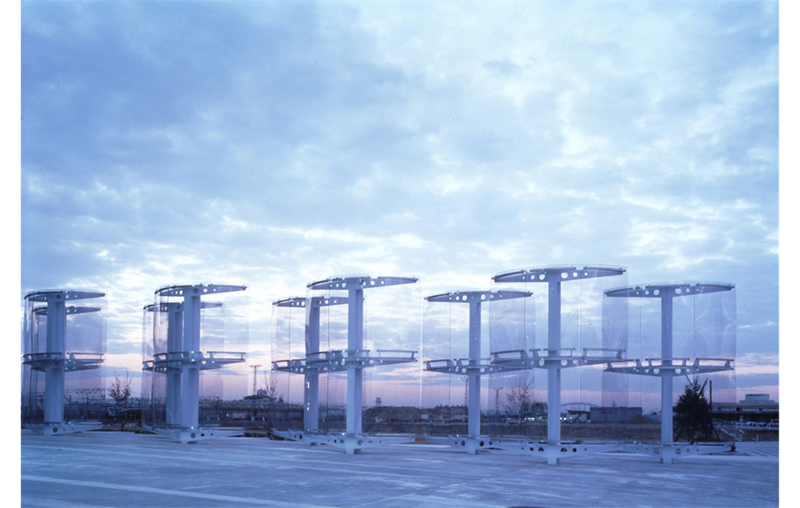 In this project, we refer to counter shading by tiny insects and fowls. 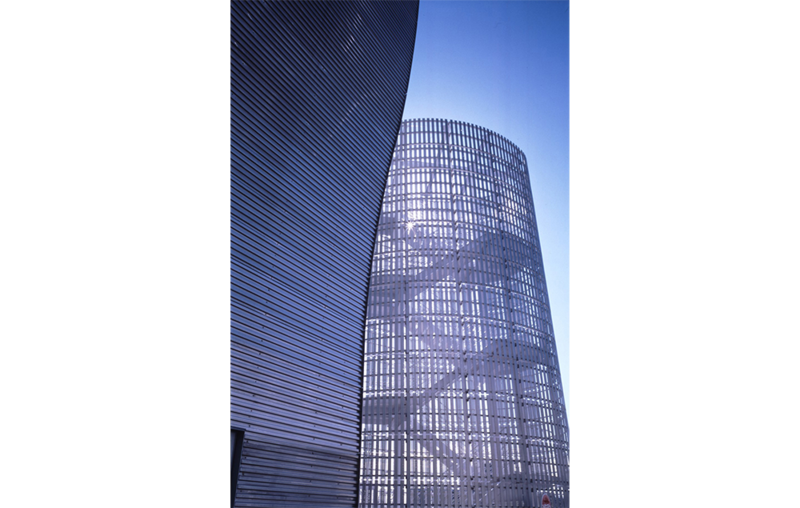 As a result, the porous expression is achieved an effect of intricate, uneven, articulated surface and small air spaces. In fact, the porosity protects the building from the strong monsoon unique in this region and lightens the weight of huge volume. More over, the articulation of the facet gives not a virtual but a real space in the architecture. A view of forest and trodden ground would recall the counter shading effect. The combination of lines, points and gaps between parts without surface dispense of handling conjunctions between materials. The gaps enable to improve the perfection of and the completion of the construction.